Kirsty Merryn is a London-based singer-songwriter whose music is heavily anchored in the folk tradition, but with influences from her background in jazz and classical music. Kirsty with her pure crystalline vocal has become a regular on London’s folk scene. Delighting the crowds with her delicately introspective piano based songs and sophisticated musical style, which are balanced beautifully by an intimate and finely observational lyrical content. 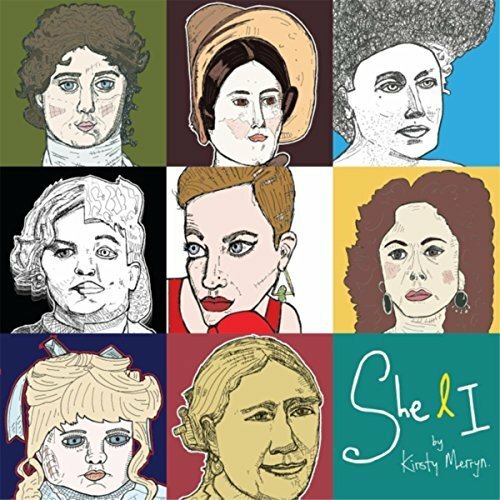 'She & I' is Kirsty's wonderful self-penned debut album, which is a timely collection of stories about inspirational women. It was supported with funding from the English Folk Dance and Song Society (EFDSS) and produced by the award-winning Gerry Diver (Sam Lee, Lisa Knapp, Jack Harris). Kirsty is normally just a solo artist with a keyboard and vocals, but for the album she has added guest musicians Tom Grashion and Gerry Diver along with the excellent Steve Knightley and Luke Jackson on guest vocals on a couple of songs. The result is a richer, deeper overall sound and feel with some lovely arrangements. Kirsty's album launch for 'She & I' was a very special one too. Held in one of London's premier music venues the wonderful Union Chapel and introduced by Show Of Hand's folk legend Steve Knightley who later joined her on the excellent duet Forfarshire. Kirsty begins the album with a song that is very close to home. 'The Pit & The Pugilist' is a family story about Kirsty's great great grandfather Tommy Mitchell a miner and boxing champion from Derbyshire. With an rich Americana/Spiritual feel 'Bring Up The Bodies' has a very addictive drone and hypnotic quality. Dedicated to Jessica Milford who wrote the witty and influential book on the American burial system and Henrietta Lacks an African American woman whose cancer cells are the source of the HeLa cell line, the first immortalized cell line and one of the most important cell lines in medical research. The cells were used without her permission. The story of Lady Emma Hamilton is the subject of 'The Fair Tea Maker Of Edgware Row'. Emma was a diplomat, fierce friend, iconic beauty, actress. artist muse and fashion icon. She lived harmoniously with her husband Lord Hamilton and lover Admiral Nelson. It was the song which Kirsty commented started the theme of the new devut album project. One of my favourite tracks on the album is 'Forfarshire' a beautiful duet with Steve Knightley. The song features the story of Grace Darling and her father William, who was a lighthouse keeper who rescued survivors of the ship-wrecked paddle steamer Forfarshire in 1838. Grace's bravery and stoicism made her a household name. Tragically she died a few years later from tuberculosis in October 1842 at the young age of 26. The story of Georgina Houghton a Victorian spiritualist and artist is the theme of 'An Evening At Home In Spiritual Seance'. The song has an ethereal almost trippy prog folk feel. Georgina was a gifted painter who claimed that her pieces were 'spirit drawings' and she was channeling the talents of famous men and the spirit realm including the archangel Gabriel. Annie Edson Taylor was one of the original female daredevils. The 'Queen Of The Mist' tells her story. In 1901 she was the first person to go over Niagara Falls in a barrel and survive. She was 63 year old at the time and a grandmother. Desiring to secure her later years financially and avoid the poorhouse, Annie used a custom-made barrel for her trip, constructed of oak and iron and padded with a mattress. She never made much money from her dangerous and potentially deadly trip. After her adventure she said to the waiting press "If it was with my dying breath, I would caution anyone against attempting the feat…. I would sooner walk up to the mouth of a cannon, knowing it was going to blow me to pieces than make another trip over the Fall." Underpinned by soft picked acoustic guitar plus fiddle from Gerry Diver and inspired by the famous biblical account, Kirsty's next subjects are 'Delilah And Samson'. Kirsty is joined on the song by the very talented Luke Jackson on guest vocals, which perfectly suits the power and mood of the song. The album closes on an atmospheric murder ballad 'The Birds Are Drunk' based on a Persian poem about an anonymous woman. Kirsty normally performs the song unaccompanied live, so it's great to hear a new fuller version on the album which gives it a richer feel.